Trade deadline day for the 2010-11 season may not be remembered for a flurry of moves, but part of the reason for that is the number of high-stakes deals completed in the three weeks leading up to Monday. The shopping started a little earlier than normal this season, and there were a couple of frenetic days of deals long before the deadline was near. A few teams have dramatically improved their chances of collecting the Stanley Cup, while a few others have stockpiled a large amount of assets for the future. In between there were many teams that tweaked their rosters with the hopes of improving their chances and few clubs that ended up being idle. Despite the fact that 24 teams remain within seven points of a spot in the postseason, there were plenty of players available and transactions completed. This deal may have zero impact on the 2011 Stanley Cup Playoffs as neither team likely will get there. What this transaction does is change the course of two franchises. Johnson was the No. 1 pick of the 2006 Entry Draft and the centerpiece of the Blues' rebuilding effort. The Avalanche had a lot of skilled forwards but were looking for a potential No. 1 defenseman. They may have added him, but they paid a big price to do so. Stewart is a 25-year-old power forward who had 28 goals last season and was en route to a great season before breaking his hand in a fight -- and he still has 19 goals in 42 games. Shattenkirk is no throw-in -- he could develop into a top-pairing defenseman. He also slowed after a great start to his rookie season, but he's 22 and could approach 40 points in his first NHL season. This deal could be the move that helps the Blues return to Cup-contender status, but they might have yielded a future Norris Trophy winner as well. It will be a fascinating swap to analyze for years to come and it is possible the "winner" could change a few times between now and the end of these players' careers. The Bruins made two other deals to bolster their depth at center, but this was the "all in" move fans have clamored for in Boston for two decades. Kaberle filled a huge need -- an offensive-minded defenseman who can quarterback the power play. With Marc Savard out for the season, expect Kaberle to be the team's top creator with the man advantage. Toronto general manager Brian Burke collected a huge return for Kaberle, who can be an unrestricted free agent at the end of the season. Colborne is the best prospect dealt at the trade deadline in the past six seasons -- a big center who could become a first- or second-line center for the Maple Leafs in a couple of seasons. The first-round pick isn't likely to stay with the organization long, but it is a valuable asset for Burke to try and move, possibly at the draft in June. If Kaberle helps the Bruins to the Cup Final or re-signs, then the Bruins will be happy to toss in the extra pick. 3) Los Angeles trades Colton Teubert, a first-round pick in 2011 and a conditional pick in 2012 to Edmonton for Dustin Penner. This was the biggest deal of deadline day. The Kings lost a top-nine left wing in Marco Sturm the day before when Washington nabbed him on waivers, but Penner is an upgrade. He has at least 23 goals in three of the previous four seasons and already is at 21 this season. When playing well Penner can provide the Kings with another power forward to go with Dustin Brown and Ryan Smyth. Edmonton didn't trade any of the other players reported to be available (Ales Hemsky, Ryan Jones, Jim Vandermeer), but the Oilers received a very nice package for Penner, who might not have been in their long-term plans. Teubert becomes the team's top prospect on defense and the Oilers now have a pair of first-round picks in the upcoming draft. The Predators were thin at center because of Matthew Lombardi's concussion and needed an offensive boost. Fisher can provide that while also being the type of responsible player coach Barry Trotz likes to have in Nashville. 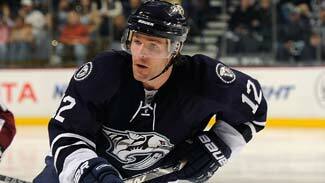 He also has two more seasons left on his contract, so this wasn't a short-term fix for the Predators. It is a good deal for Nashville on the ice, and it already has proven to be a good move at the box office. Fisher's wife, country music star Carrie Underwood, and her celebrity friends clearly have had an impact on attendance since Fisher's arrival. Conversely, the Senators added a lot of draft picks this month, but this is the biggest prize of the lot. Expect GM Bryan Murray to be rooting for the Predators the rest of the season -- that second pick only becomes part of the deal if Nashville wins at least one round in the playoffs. This was a big trade between two playoff contenders trying to address some weaknesses both in the short and long term. The Stars have several quality young forwards but were lacking on the blue line behind Stephane Robidas. The Penguins were ravaged by injury at forward and Goligoski has been stuck on the third defense pairing for much of the season. Dallas adds a 25-year-old defenseman who already has made an impact and should be a top-four player for them moving forward and maybe the No. 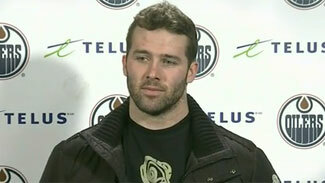 2 behind Robidas. Pittsburgh lands a 23-year-old forward who already has 72 NHL goals in just his third season and could play next to Sidney Crosby or Evgeni Malkin for the next several seasons. The Capitals have not had a productive No. 2 center behind Nicklas Backstrom since Sergei Fedorov left for Russia at the end of the 2008-09 season -- and even he didn't have a great season, save for a playoff series-winning goal against the New York Rangers. They have been trying to get by with rookies Marcus Johansson and Mathieu Perreault as their second- and third-line centers, but that has played at least some role in the team's dip in offense this season. Arnott fills several needs for the Capitals. He gives them a big center in their top nine forwards (Steckel is big, but mostly was used on the fourth line), and Arnott has plenty of playoff experience. He and Mike Knuble are the only two players on the roster with their names on the Stanley Cup. Toss in Dennis Wideman and Marco Sturm and the Capitals look a lot different than they did 48 hours ago. New Jersey general manager Lou Lamoriello was able to get a high draft pick and a decent replacement for Arnott back for a rental player. Steckel plays sound defense and wins faceoffs -- you have to think he'll fit well with the Devils. Honorable mentions: N.Y. Rangers trade for Bryan McCabe; Washington adds Dennis Wideman; Boston picks up Chris Kelly; Philadelphia acquires Kris Versteeg.